Salk discovery may help doctors slow progression and recurrence of brain cancer. Scientists have long believed that glioblastoma multiforme (GBM), the most aggressive type of primary brain tumor, begins in glial cells that make up supportive tissue in the brain or in neural stem cells. In a paper published October 18 in Science Express, however, researchers at the Salk Institute for Biological Studies have found that the tumors can originate from other types of differentiated cells in the nervous system, including cortical neurons. GBM is one of the most devastating brain tumors that can affect humans. Despite progress in genetic analysis and classification, the prognosis of these tumors remains poor, with most patients dying within one to two years of diagnosis. The Salk researcher’s findings offer an explanation for the recurrence of GBM following treatment and suggest potential new targets to treat these deadly brain tumors. “One of the reasons for the lack of clinical advances in GBMs has been the insufficient understanding of the underlying mechanisms by which these tumors originate and progress,” says Inder Verma, a professor in Salk’s Laboratory of Genetics and the Irwin and Joan Jacobs Chair in Exemplary Life Science. The blue, green, red and yellow in this image indicate that these neurons are producing proteins typical of immature nerve cells, evidence that they have reverted to a stem cell-like state. Salk scientists found that mature cortical neurons are capable of reverting to this immature state and developing into an aggressive type of brain tumor that was previously thought to only develop from neural stem cells or glia, another type of cell in the brain. Image courtesy of Dinorah Friedmann-Morvinski. To better understand this process, Verma’s team harnessed the power of modified viruses, called lentiviruses, to disable powerful tumor suppressor genes that regulate the growth of cells and inhibit the development of tumors. With these tumor suppressors deactivated, cancerous cells are given free rein to grow out of control. To do that, Verma and his colleagues attached small RNA molecules, known as short hairpin RNAs, to the modified viruses and injected them directly into very few cells in the brains of genetically engineered mice that express an enzyme known as CRE specifically in neurons, astrocytes or neural stem cells. The modified viruses target two genes—-neurofibromatosis 1 (NF1) and p53—-that, when mutated, are implicated in severe gliomas like GBM. Using sophisticated analytical techniques, they discovered that neurons genetically converted by the lentiviruses that also produce green fluorescent protein (GFP) as a marker to track the progression of tumors are capable of forming malignant gliomas. Because the origin of glioblastomas from neurons has not been previously reported, the Salk scientists provided further evidence that mature neurons can be transformed by these oncogenes by isolating cortical neurons from genetically engineered mice and transducing them with one of the lentiviruses. The neurons that were transplanted back into the mice developed the same tumors as the ones in the laboratory. 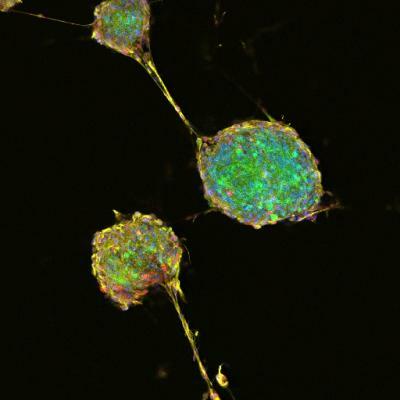 If scientists can block the process of dedifferentiation or proliferation of dedifferentiated neuroprogenitor cells, they may be able to stop tumor progression. That’s important in an aggressive disease like GBM because of its high rate of recurrence. The scientists say the tumors in their mouse model are similar to GBMs that affect humans. Because they have the same pathology and characteristic genetic signature, scientists can study potential therapies in mice that should, theoretically, work in humans. While they may not eradicate GBM, these therapies may slow the progression of the disease and improve patients’ quality of life. Other researchers on the study were Eugene Ke, Yasushi Soda, Tomotoshi Marumoto and Oded Singer of the Salk Institute; and Eric Bushong and Mark Ellisman of the University of California, San Diego. The work was supported by the National Institutes of Health, Ipsen/Biomeasure, the Leona M. and Harry B. Helmsley Charitable Trust, the H.N. and Frances C. Berger Foundation, and the National Center for Research Resources. Image Source: Stem cell like neuron image adapted from a Salk Institute release image courtesy of Dinorah Friedmann-Morvinski.